Jude’s godmother, a childhood friend of mine (Trisha you’re awesome! ), is forever sending the most awesome care packages for the kids. In all seriousness she is one of the most thoughtful people that I have ever known. A couple of years ago she sent this book for the boys, Shark vs. Train. We’ve read it dozens of times, but hadn’t touched it in months. Yesterday the boys rediscovered it, and wow we read it over and over. Shark vs. Train starts out with two little boys (who look strikingly like Yeats and Jude) running for the toy box, where they pull out a train and a shark. The book is then the story of what happens when a shark and a train compete in various tasks, from selling lemonade to trick or treating to playing basketball to jumping cars Evil Kenevil style. The pictures are just wonderful, incredibly detailed and just cartoonish enough to really appeal to a 4-7 year old. There are enough surprises in the details to keep us looking closely with every reading. The book is written with some tongue and cheek style to engage the parents as well as the children, which is wonderful considering we tend to read our favorite books several times a day. One of the best parts of the book is that the boys go to replay the story! 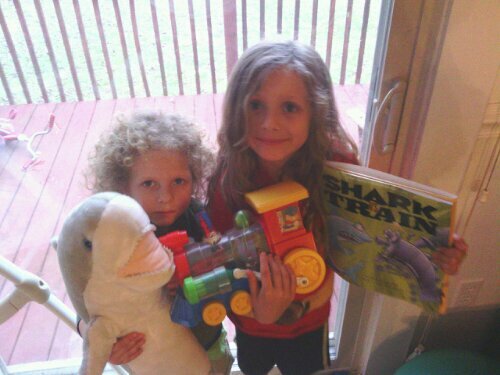 Immediately Jude ran to his room to grab his shark and the train. Then they played in the living room with them for the longest time. I love books that inspire play and especially creative play, which is a super aspect of this one. We read a LOT of books in our house. Some become staples and favorites, others we only read once. Shark vs. Train is one that we come back to again and again. Click on the picture below for a link to where to buy this great book for a kid in your life! Or go check out your local library.